Mae Teah Waterfall. Located at Doi Keaw,Jorm Thgong under supervision of Ob Luang National Park. 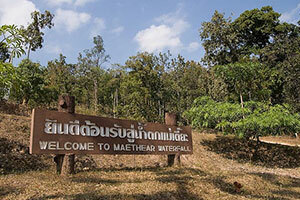 Mae Teah Waterfall is located near the middle of the jungle. The waterfall is approximately height 80 meters and wide around 15 meters and has four levels, with a distance of about 5 km This waterfall has water all year. People around here use water from here to the farm. This place good for a study of nature.